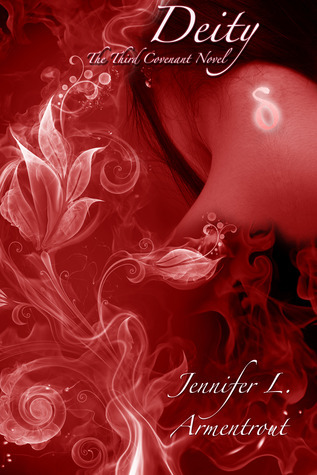 From now on, the year 2012 shall be known as The Year of Cliffhangers and Jennifer L. Armentrout as the person responsible. Two in a row is more than I can take. Why not just hand me a rope to hang myself with instead? Where are the Furies when you need them? This will be a moderately short review because there really isn't much to write about. With Pure and Deity (and Opal), Armentrout restored my faith in her and and turned me into an addict. I have now grudgingly joined hordes of fans who eagerly await her every release. It’s not all roses and rainbows, though. I think what's stopping this series from truly becoming one of my favorites is that, thanks to the Half-Blood debacle, I can't stop comparing it to Vampire Academy. Even though Alex is now a heroine in her own right, a part of me still sees her as a pale copy of Rose Hathaway. The same goes for Aiden – as amazing as he is (and trust me, he is one amazing guy), I can't help but compare him to Dimitri on occasion, and of course he loses every time. That is the consequence of Armentrout's initial plagiarism. Although she found a different path for her characters (and hopefully for herself), all those connections my mind made at the beginning simply refuse to go away. Although reluctantly, I feel that I must also mention a series of editing issues I’ve come across in Deity. Awkward, clumsy sentences and incorrect word order are just some of the things a more careful reader will surely notice. This could have easily been avoided which is why it upset me so much. But I didn’t set out to write a negative review. Deity set a new course for this series, an expected one perhaps, but a new and satisfying direction nonetheless. Aside from the horrendous cliffhanger, I have no objections whatsoever. With Deity, Armentrout gave me exactly what I’ve learned to expect from her. As for the said cliffhanger, I’ve been told that Elixir, a novella from Aiden’s point of view, really takes the edge off and I’m looking forward to it. Without revealing too much, I'll try to ease the minds of those who are like me: the (in)famous love triangle finally gets resolved in this book, or at least Alex sees things for what they really are. If you’re anything like me, you were severely annoyed by the Aiden-Alex-Seth mess in the second book, but rest assured, it does get better. That simple act stole my breath, my heart. But even as he pulled away, I realized that he couldn't steal something he already had. At this point, I'd say I'm enjoying this series despite myself. It is extremely addictive and fun, but at the same time, I can't forget how it started. Perhaps with Apollyon, Armentrout will break those last stubborn connections and make me look at things differently. Either way, I'm looking forward to it. I haven't read VA, so I dunno if they're similar and if JLA copied the VA series. But, I can say that even if she did, her books are still quite entertaining. Besides, with all those novels coming out every day, it's impossible the ideas won't get copied. I love this review! You've hit my thoughts spot on! Despite the Vampire Academy similarities, I still enjoy reading this series, but still can't stop comparing Alex with Rose, Aiden with Dmitri, and Seth with Adrian. Of course the originals totally win, but I want to see something original and unique come out of this series. Agh!! So annoyed about the news of a serious cliffhanger. Just what more pain do we need? I haven't fully committed to continuing on with this series. There's just something about the whole Aiden-Alex-Seth thing that's holding me back. And the cliffhanger! Arrrgggghhh. That'll drive me batty. The Year of Cliffhangers, yesssssss! *growls at Unspoken* What is this new fad we have come across? I do not approve! Fantastic review, Maja! I love Jennifer's Obsidian books, so I've been thinking about picking up these books for quite some time, but something always stops me. I guess I just don't want to be disappointed? Or perhaps I don't think I can handle her notoriously famous cliff-hangers! Anyway, I'm glad you enjoyed Deity, and OMG I can't wait to get my hands on Opal!!!! I can barely control my excitement :D Ah I hate love triangles, but it's good to know that it does get better. :) Fab review, Maja! Honest to God I had the first book in this series and I shelved it after your scathing review of it calling it a VA ripoff so I am surprised to see you jumped back in. I intend to check this series out but I cannot do the cliffhangers they make me so crazy. I will be content to read them when they are all out. The statement "At this point, I'd say I'm enjoying this series ... It is extremely addictive and fun, but at the same time, I can't forget how it started" captures exactly how I feel about this series. The first book was like a ripoff of the VA series but I like where it's heading now and can't wait to find out what's going to happen in Apollyon. I'm not as crazy about the Lux series though. I'm pretty sure that's because Daemon pisses me off. EEEEEE Maja, I'm currently reading this book! I just finished Pure and actually really enjoyed it so I hope I enjoy Deity a lot too ;) I'm really looking forward to read Elixir too! Awesome review, Maja ♥ So glad you enjoyed it! I've read much on the VA debacle which is why I haven't bothered picking up this series. VA and I didn't gel at all this year so I'm guessing this series is one that I can do without. Gotta say that I'm surprised you kept up with the series. I know I wouldn't have the patience nor time.